Received: July 18, 2017; Revised: October 9, 2017; Accepted: October 10, 2017.; Published online: February 5, 2018. Patients with double-inlet left ventricle usually have a small ascending aorta. In the Norwood procedure, which involves a staged operation, a neoaorta is constructed with a homograft, and the pulmonary artery plays a role in the systemic circulation. Dilatation or aneurysmal changes can occur over time due to the exposure of the neoaorta to systemic pressure, which may induce adverse effects on adjacent structures. We report a rare case of surgical repair for neoaortic root dilataiton with aortic regurgitation, compressing the left pulmohary artery, in a patient who underwent the Norwood procedure. A newborn boy with double-inlet left ventricle, aortic arch hypoplasia with coarctation, complete transposition of the great arteries, and bilateral superior vena cava underwent bilateral pulmonary artery (PA) banding, a patent ductus arteriosus (PDA) stent, and a reverse Blalock-Taussig (BT) shunt (4 mm) at another hospital. At the age of 7 months, the patient underwent a Norwood procedure accompanied with the removal of the previously applied bilateral PA banding, PDA stent, and BT shunt. Atrial septectomy and coronary sinus unroofing were performed, and bilateral bidirectional cavopulmonary shunts were created. During the excision of both PAs from the posterior wall of the main pulmonary artery (MPA), we applied a single U-shaped large button to spare the large anterior MPA wall, and the spared anterior wall of the MPA was incorporated into the neoaortic reconstruction . The defect in the posterior wall of the MPA was repaired with bovine pericardium, and the excised area of the branch PA could be approximated with native tissue (Fig. 1). The patient was 3 years old and weighed 12.5 kg at the time of the Fontan operation. Preoperatively, we found mild to moderate aortic regurgitation (AR) due to aneurysmal tissue around the right cusp of the neoaorta, with aortic root dilatation on echocardiography. A chest computed tomography (CT) scan identified a large neoaorta compressing the left pulmonary artery (LPA) (Fig. 2A). Angiography showed scant LPA flow (Fig. 2B). The Nakata index was 130 mm2/m2 due to the severely compressed PA. Therefore, aortic valve repair and reduction of the dilated aorta were necessary in order to relieve LPA compression through the Fontan procedure. Cardiopulmonary bypass was established with cannulation of the innominate artery, right atrium, and inferior vena cava. During selective cerebral perfusion (34 minutes), an extracardiac conduit Fontan procedure was performed using a 16-mm polytetrafluoroethylene (W. L. Gore & Assoc., Flagstaff, AZ, USA) vascular graft. After the division of the neoaorta and PA anastomosis site, the neoaorta was transected for exploration of the neoaortic valve. To reduce the AR, we sliced the thickened neoaortic leaflet, excised the aneurysmal tissue around the right cups, and approximated the remnant tissue by interrupted sutures. For the posterior reduction aortoplasty, the aneurysmal neoaorta was replaced with a 14-mm Hemashield graft (MAQUET Cardiovascular LLC, Wayne, NJ, USA) and the posterior aorta space was dissected to make space for the LPA (Fig. 3). At the end of the procedure, the previously compressed LPA was no longer compressed by the newly reconstructed aorta with sufficient space. The total cardiopulmonary bypass time was 331 minutes and the aortic cross-clamping time was 172 minutes. Postoperative echocardiography on day 2 revealed a good Fontan pathway, good ventricular function, and trivial neoaortic regurgitation. 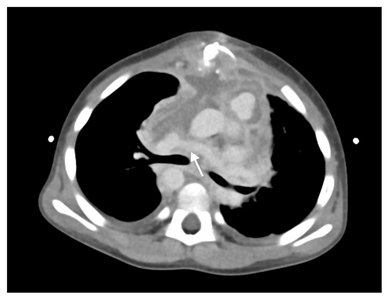 The chest CT showed a decrease in the size of the neoaorta (from 31 mm to 14 mm) and relief of the compressed PA (from 1.86 mm to 4.78 mm) (Fig. 4). Echocardiography performed prior to discharge showed restoration of the flow through the LPA. It also showed a decrease in the aortic annulus (from 18.8 mm, z-score 6.54 to 15.6 mm, z-score 2.78) and sinus (from 29.9 mm, z-score 8.72 to 21 mm, z-score 2.64). The patient was transferred to the general ward on postoperative day 11. His postoperative recovery was uneventful and he was discharged on postoperative day 26. We report a rare case of neoaortic root dilatation with AR and neoaortic aneurysmal changes after a Norwood procedure. Several articles have reported dilatation of the pulmonary valve or PA after exposure to high systemic pressure following an arterial switch operation or a Ross operation. However, progressive dilatation of the neoaorta after the Norwood procedure has rarely been reported, although Cohen et al. reported the progression of neoaortic root dilatation and neoaortic regurgitation over time after staged reconstruction for hypoplastic left heart syndrome. The etiology of neoaortic root dilatation is still unknown. Since the pulmonary valve becomes the conduit for both systemic and pulmonary blood flow in patients who have undergone a PA-to-aortic anastomosis, the hemodynamic situation of anastomosis patients is different from that of patients who underwent an arterial switch. Cohen et al. suggested that the neoaortic valve develops more collagen and elastin fibers in response to higher shear strength and tensile stress imparted by the systemic blood flow and vascular resistance. Niwa et al. reported that significant cystic medial necrosis was present in the aorta and PA in a variety of heart defects, including transposition of the great arteries, single ventricle with pulmonic stenosis, tetralogy of Fallot, and bicuspid aortic valve. Ehsan et al. carried out a histologic study and showed a striking accumulation of myxoid material, as well as variant vasculature, in both the native and engrafted portions of the neoaorta. The diminished distensibility of the aortic root may affect valve competency. Brewer et al. observed that a rigid aortic root results in fatigue stress to the valve leaflets. In the classic Norwood procedure, the MPA is transected at its proximal portion and a neoaorta is reconstructed with a homograft or other nonviable material . Some patients may experience a large ascending aorta, which can lead to extrinsic compression of the surrounding vessels after the Norwood procedure . Another point to consider is the use of non-viable material for neoaorta reconstruction. The development of neoaortic valve regurgitation and neoaortic aneurysm after stage II of the operation may be related to the patch material used for neoaorta construction, the pulmonary valve and its sinotubular component, or a combination of all these factors . Some unfavorable effects may occur due to the growth of the neoaorta. Mahle et al. reported that potential LPA stenosis might also exist even years after the completion of palliative surgery because of the continuous growth of the neoaorta throughout childhood. When we use non-viable material, we must consider its limited growth potential and the possibility of aneurysmal changes. In this case, as we considered the possibility of LPA stenosis due to continuous neoaortic dilatation and aortic rupture due to neoaortic aneurysmal changes caused by the thinning of the aortic wall, we used an artificial graft for neo-aorta reconstruction. Fig. 1. Stages I, II, and III of the Norwood procedure. In the Norwood procedure, a single U-shaped large button is applied to spare the large anterior main pulmonary artery wall. After extracardiac Fontan anastomosis, a reduction plasty for the enlarged right coronary artery, reconstruction of the neoaorta is performed. Sung, SC, Chang, YH, Lee, HD, Ban, JE, and Choo, KS (2009). Technical modification of the neoaortic reconstruction in Norwood procedure: sparing of anterior wall of the main pulmonary artery. J Card Surg. 24, 437-9. Cohen, MS, Marino, BS, and McElhinney, DB (2003). Neo-aortic root dilation and valve regurgitation up to 21 years after staged reconstruction for hypoplastic left heart syndrome. J Am Coll Cardiol. 42, 533-40. Niwa, K, Perloff, JK, and Bhuta, SM (2001). Structural abnormalities of great arterial walls in congenital heart disease: light and electron microscopic analyses. Circulation. 103, 393-400. Ehsan, A, Singh, H, Vargas, SO, Sachweh, J, and Jonas, RA (2005). Neoaortic aneurysm after stage I Norwood reconstruction. Ann Thorac Surg. 79, e23-5. Brewer, RJ, Deck, JD, Capati, B, and Nolan, SP (1976). The dynamic aortic root: its role in aortic valve function. J Thorac Cardiovasc Surg. 72, 413-7. Pigott, JD, Murphy, JD, Barber, G, and Norwood, WI (1988). 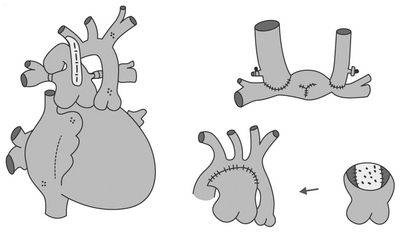 Palliative reconstructive surgery for hypoplastic left heart syndrome. Ann Thorac Surg. 45, 122-8. Mahle, WT, Rychik, J, Weinberg, PM, and Cohen, MS (1998). 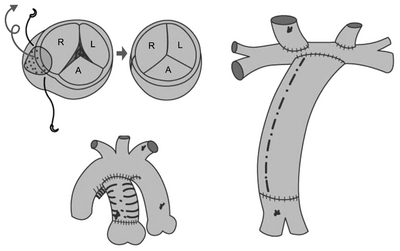 Growth characteristics of the aortic arch after the Norwood operation. J Am Coll Cardiol. 32, 1951-4.